Be prepared to experience the magic of the circus with the best of psychedelic music! Amir Dvir, started his musical career back in 97 at the very young age of 16, after playing years of guitar, he started his electronic music career under the project "Luminus", which he released 3 albums under that name with Hommega and Phonokol Records. A few years later in the year 2000 Amir decided that he wants to take a different musical direction and he started "Illumination" project, it didnt take much time until he teamed up with one of Hommega's founders "Xerox" and they formed the duo "Xerox & Illumination", which they released 4 albums and played gigs all over the world for more then 10 years. In May 2007 the british "DJMag" magazine voted X&I as one of the 10 influential psytrance acts. Around the year 2012 Amir started the "Born Sleepy" project, his solo side project that focused on a more slower, flowing progressive music and released several tracks in labels such as Iboga, Hommega and TIP records. Amir is also part of the duo "Humanoids" which he formed together with OldSkool Goa artist "Sandman" in 2014. Nowadays, Amir joined the Zero1 Label Family, coming with a new "Illumination" sound, filled with analogue synths and intelligent production. Lah Narrad is the psychedelic alter ego of Darran Hall, Born in Belfast N.Ireland, Making Music has been a part of his life from an early age, playing guitar and drums in various punk bands, until one fateful night in 2006 in Holland when he found himself at his first Psy Trance Party. From this point on Musically and personally his life had changed, After returning to Ireland in 2009 he started to orgainise the Tongue on the Roof psy trance Parties in Belfast and the infamous Alien Vibrations gatherings where he started to play warm up DJ sets at these events, Soon after he was playing sets all over Ireland and abroad, Focusing on Night Full on and forest sounds mixed together Curating an epic voyage into the subconsious while maintaining a bouncey possitive Psychedelic edge in 2010 curiosity set in as to how to produce these magical tunes and a journey into programming, synthesis and DAWs began, Sculpting his sound into what is now a destinctive Full power trip. Brazilian artist based in Ireland, has attended more than 10 years of psytrance parties and have been playing in the biggest psytrance festivals/clubs in Ireland for the last few years. 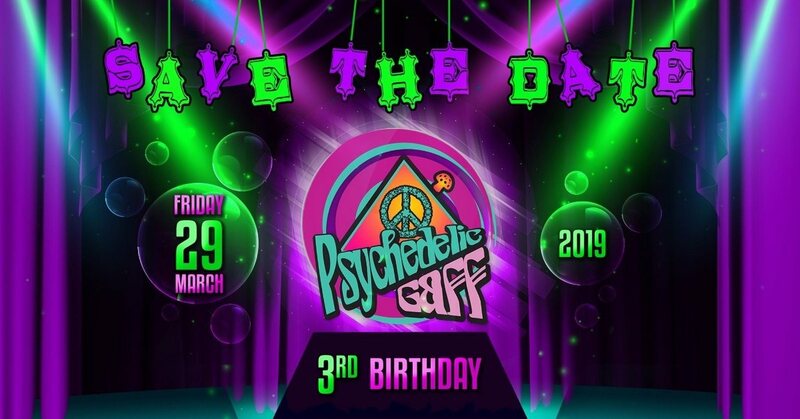 Co-founder of the Psynonymous parties, started DJing in 2014 progressive psytrance and has now shifted to a more energetic Twilight/Night Full on under the Irish label Galactic Groove Records. The Hypknotoad project began sometime in early 2001 for 15 years nothing happened. Well known for his bare bones setup he usually requires other artists to lend him a laptop and headphones. In recent years Rick has played at many Irish parties, well known for his curious blend of terrible mixing and non-existent dance moves.